NAZK allegedly was bribed to turn blind eye to discrepancies in e-declaration of incomes. 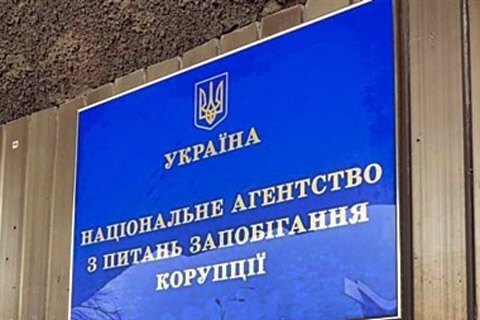 Criminal proceedings instituted by the National Anti-Corruption Bureau on the malpractices with electronic declarations in the National Anti-Corruption Agency contains information about a 1 mn hryvnia bribe given by an unnamed member of parliament. In the response to a request by MP Mustafa Nayem, which the deputy posted on Facebook NABU said its detectives on 10 October file a case with the Unified Register of pre-trial investigations based on the statements of an individual. The individual claimed that criminal group consisting of the chairman and a few members of NAZK, a high ranking official of the Presidential Administration, and a senior SBU officer may have committed a series of corruption crime. "Among other facts, the statement indicated that one of NAZK members received 1 mn hryvnia from a people's deputy of Ukraine for concealing discrepancies discovered during a comprehensive check of the e-declaration of this individual. The statement claimed that the bribe proceeds were later divided among the other members of the criminal group," the NABU document says. Last week, the former head of the NAZK Department of Financial Control and Lifestyle Monitoring, Anna Solomatina said that the agency head and her colleagues falsify the results of complete checks of e-declarations. She said, the agency was fully in control of the Presidential Administration. The Prosecutor-General's Office later handed over to the SBU the case initiated by the NABU on Solomatina's exposure.